Jim Johannson, the longtime US Olympic men’s hockey general manager, played for the 1988 and 1992 US teams and helped Wisconsin win the NCAA championship as a freshman. 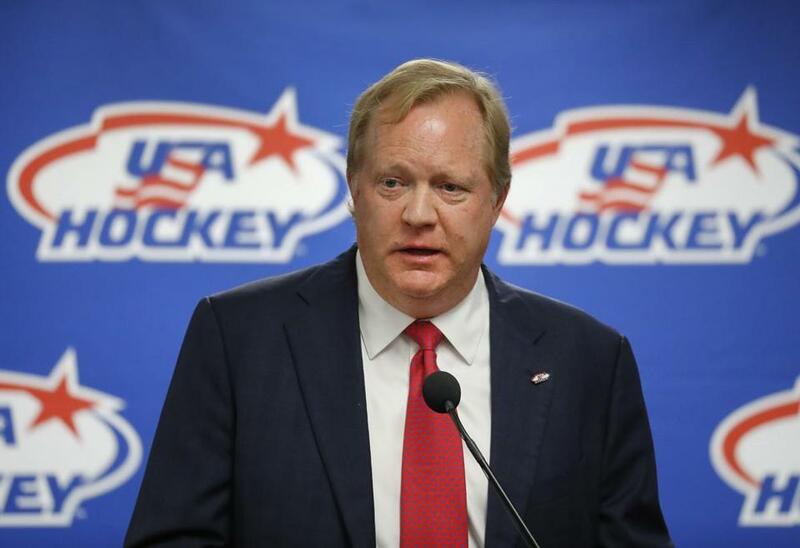 Longtime USA Hockey executive and US Olympic men’s hockey general manager Jim Johannson died unexpectedly Sunday at age 53, shocking the sport less than three weeks before the start of the PyeongChang Games. Johannson died away in his sleep at his home in Colorado Springs, according to USA Hockey. Executive director Pat Kelleher said the organization is ‘‘beyond shocked and profoundly saddened’’ by the loss of the Rochester, Minn., native. His death came in the midst of the most high-profile role in his career: putting together the US men’s Olympic hockey team without NHL players going to South Korea, a position he relished after doing so at several world junior and world championships. ‘‘He had a couple of the greatest days of his life at USA Hockey recently to be able to call all these guys that never thought in their lives they'd play on a US Olympic hockey team, and he got to tell them that they realized a dream,’’ Kelleher said by phone. ‘‘I think that meant as much to Jimmy as it did to any of the players.’’ Johannson played for the US team in the 1988 and 1992 Olympics. The United States faces Slovenia in its Pyeongchang opener Feb. 14. ‘‘We lost a true friend in Jim Johannson today,’’ said US coach and 1988 teammate Tony Granato said. Johannson played college hockey at Wisconsin and helped the Badgers win the NCAA championship as a freshman. He was selected by Hartford in the seventh round of the 1982 draft, but never played in the NHL. Senior Kia Nurse scored 24 points and freshman Megan Walker added a career-best 22 to help No. 1 UConn rout Temple, 113-57, in Philadelphia. The Huskies (18-0, 7-0 American) came into the game off an 18-point win over Tulsa that left coach Geno Auriemma extremely annoyed with his team, calling that game one of the worst performances he’s seen in his 32 years of coaching. Sunday’s game didn’t get off to a good start for UConn with Temple (9-9, 1-5) scoring the game’s first 6 points. Then UConn got going. Nurse and Walker helped UConn to a 28-18 advantage after one quarter and a 24-point lead at the half. The Huskies kept the rout going in the second half, hitting eight of their first nine shots and scoring 34 points in the third quarter — the most this season by UConn. Mia Davis scored 19 points and Tanaya Atkinson added 15 to lead the Owls, who have dropped six of their past seven . . . Guard A.J. Alix made a go-ahead 3-pointer with 1:04 remaining and Nicole Ekhomu added a free throw with 7.8 seconds left, helping No. 12 Florida State leave second-ranked Louisville with its first loss of the season, 50-49. The Seminoles (18-2, 6-1 ACC) trailed, 22-9, after the first quarter before rallying. Arica Carter’s 3-pointer put Louisville (20-1, 6-1) ahead with 1:54 to go. Alix answered from long range, and then Ekhomu made the second of two from the line . . . Victoria Vivians had 24 points and nine rebounds as No. 3 Mississippi State defeated No. 6 Tennessee, 71-52, in Knoxville, Tenn., to remain unbeaten and match its best start in school history. Mississippi State (20-0, 6-0 SEC) also got off to a 20-0 start last season and went on to finish 34-5 with a loss to South Carolina in the NCAA Tournament final. Tennessee (16-3, 4-2) has lost three of its last four, with all four of those games coming against Top 25 foes . . . Arike Ogunbowale and Jackie Young each scored 23 points as fifth-ranked Notre Dame (18-2, 6-1 ACC) shot 62 percent in routing visiting Clemson, 90-37. Kobi Thornton had 16 points and 10 rebounds for the Tigers (11-9, 1-6 ACC), who shot 26 percent (15 of 58) . . . Senior A'Ja Wilson came off the bench and scored 26 points after missing two games because of an ankle injury, leading No. 10 South Carolina over host Kentucky, 81-64. Wilson, who tops the Southeastern Conference in scoring with 23.2 points per game, showed no ill effects in her return from a sprained right ankle. She shot 10 for 12 and also had eight rebounds. Former Kentucky forward Alexis Jennings added 17 points and seven rebounds for the Gamecocks (16-3, 5-2). Maci Morris led Kentucky (9-11, 1-5) with 19 points. Trae Bell-Haynes scored 17 points to reach a program milestone and Vermont won its ninth straight game with a 76-53 victory at Hartford. First-place Vermont (16-5, 6-0 America East) extended its nation-best, regular-season conference winning streak to 27 games. Bell-Haynes entered needing 11 points to reach 1,400 points for his Vermont career. He scored 13 points in the first half to become the 11th Catamount to surpass the plateau. He also moved to 10th in scoring, far behind leader Eddie Benton (1992-96) at 2,474 points. Payton Henson added 18 points and Everett Duncan 12 for the Catamounts. J.R. Lynch scored 10 points for Hartford (11-10, 4-3), which fell to 2-31 against Vermont since 2003 . . . Clemson forward Donte Grantham will miss the rest of the season with a torn anterior cruciate ligament in his right knee. The 20th-ranked Tigers (16-3, 5-2 ACC) are trying for their first NCAA Tournament berth in seven years, but the loss of Grantham is a major blow as the 6-foot-8-inch senior was second on the team with 14.2 points and 6.9 rebounds per game. Lara Gut won the final World Cup super-G before next month’s Olympics, signaling a return to form after knee surgery last season. It was the 24th victory of Gut’s World Cup career. In a race on a shortened course at Cortina D'Ampezzo, Italy, that was shaped by strong winds, overcast conditions, and overnight snowfall, Gut clocked 1 minute, 14.78 seconds for a 0.14-second advantage over Johanna Schnarf of Italy. Due to increasing wind, the race was called off after 44 of 58 skiers had started. Gut ruptured her left ACL last February in a crash during slalom warmups for the combined medal event of her home world championships in St. Moritz. The injury ensured she lost her overall World Cup title to American Mikaela Shiffrin. Nicole Schmidhofer of Austria finished third, 0.27 behind. Lindsey Vonn, the record holder in Cortina with 12 wins, was slowed by a strong gust of wind and finished sixth, 0.37 back. Shiffrin, the overall World Cup leader, missed a gate midway through her run and Italian favorite Sofia Goggia hit a gate and also did not finish . . . Henrik Kristoffersen of Norway won a men’s World Cup slalom in Kitzbuehel, Austria, ending Marcel Hirscher’s five-race winning streak. Carrying a 1.05-second lead over the Austrian from the opening run, Kristoffersen lost only 0.08 of his advantage in a wild second run in dense snowfall to claim his first victory of the season and 16th overall . . . American Summer Britcher won gold in the women’s World Cup luge sprint race at Lillehammer, Norway, for her second victory on the circuit in as many days. Britcher now is third in the overall World Cup standings, with a very realistic chance of getting to the No. 2 spot at next weekend’s World Cup finale in Sigulda, Latvia. The weekend wins gave Britcher five World Cup gold medals in her career, a record for any USA Luge slider in individual events on the circuit . . . Gus Kenworthy and Nick Goepper each made the US Olympic slopestyle team by finishing second and third in Mammoth, Calif., in the season’s final qualifying contest — the same order they came in four years ago at the Sochi Games. Maggie Voisin was the only woman to get the two podium finishes needed to secure a spot. Discretionary picks for the freestyle and freeskiing teams will be made this week . . . Canadian Ivanie Blondin won her first speedskating World Cup title at a classic distance with victory in the women’s 3,000 meters in Erfurt, Germany. Mallory Pugh scored a pair of second-half goals as the US women’s national soccer team opened the year with a 5-1 victory over Denmark in San Diego. The match was the first in a year that will include qualifying for the 2019 Women’s World Cup in France. Alex Morgan, Julie Ertz, and Crystal Dunn also scored for the top-ranked Americans. While Ertz was playing for the US women, husband Zach Ertz was playing for the Philadelphia Eagles in the NFC Championship game . . . The Revolution selected defender Nicolas Samayoa from Florida Gulf Coast University with the 78th overall pick in the fourth round of the 2018 MLS SuperDraft . . . Premier League club Watford fired manager Marco Silva, and replaced him with Javi Gracia, the ninth change in less than six years. Watford had fallen to 10th place in the Premier League after winning only one of its last 11 games . . . Graduate student Kevin Lohan, a defenseman on the Boston College hockey team, is out indefinitely after, according to the school’s website, he was victimized by an unprovoked assault Friday at a restaurant on Boylston Street in Boston . . . Stanford quarterback Keller Chryst plans to transfer for his final season of eligibility after he graduates in June. He will be immediately eligible. Chryst began last season as the starting quarterback for the Cardinal before being replaced midway through the year by K.J. Costello . . . University of Miami cornerback Malek Young’s football career is over after the sophomore sustained a neck injury during last month’s Orange Bowl that will require career-ending surgery to repair.